This is Our Blog. | Aston Gifts Add Ecommerce to The Aston Workshop Repertoire. Aston Gifts Add Ecommerce to The Aston Workshop Repertoire. The Aston Workshop is a long-term client of Inovica's and one that we always enjoy working with. They're constantly looking for ways to improve their business and be more creative online, which is something we're always happy to help with! The Aston Workshop is an Aston Martin specialist based in the North East of England. They deal primarily in the sale, restoration, and repair of Aston Martin cars. However, The Aston Workshop also has some peripheral modes of business, including selling Aston Martin Parts, Aston Art and also Aston Gifts. The Aston Workshop is already a tremendously successful commercial business, having built up a worldwide reputation for quality and standards, so there was already a strong base from which to launch these additional services that the Workshop can offer. 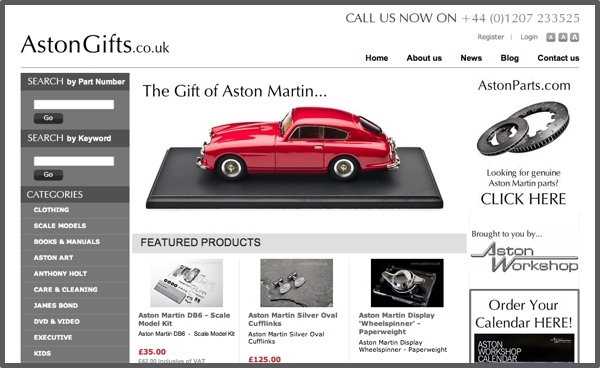 Aston Gifts is the latest website that we have created for The Aston Workshop, using our in-house ecommerce platform, to allow them to promote everything from scale models to in-car entertainment systems. The website uses a clean and classic look to be in-keeping with the Aston brand, and using SEO friendly pages and detailed categorisation, helps the Aston Gifts website to not only look good, but to rank well in the search engines and convert visitors into buyers. The Aston Workshop are able to frequently update the Aston Gifts website, through the in-built content management system to ensure that they can display their ever-growing range of stock, to their ever-growing list of fans and customers.